Kate has been taking a number of fellow mums through a striking mums journey. I have been reading her posts, I have been viewing the link ups of fellow bloggers and leaving comments when I have managed to. 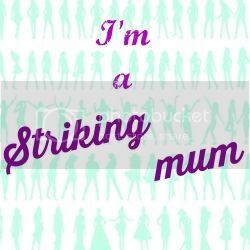 As you can see this is my first post for Striking Mums, for some reason over the last few weeks I just haven't been able to put into words how I feel about certain topics and questions. They've all been very inspiring posts that Kate has written and I decided to think more privately but now my blogging mojo has returned, I'm ready to join Kate and the other wonderful mothers. I start with Kate's questions on being different. 1. Are you different and, if so, how? I'm one of these people that believe we are all very different. We are all here for a reason. I'm included in that. I can't tell you my reason, not accurately but I'm different in that I am a lot, lot more sensitive than a lot of people and I look at the story behind a person. I think a lot before I speak, before I act and I always want to make people feel better. I'm not perfect and especially with my family I can be bad tempered and quick to snap. My difference is my reason to be here, to help people in some way. I'm sure one day it'll maybe become a career. 2. Do you celebrate your uniqueness or strive to fit in? I suppose I celebrate it in a way. I love to share random acts of kindness and tend to show what I've done in regards to that. Not for the self gratification but in the hope I can inspire further acts of kindness. Otherwise I don't really. I hate that I'm super sensitive, I don't particularly like that I'm an introvert and never go to my husbands football team get togethers despite them all being lovely people. But I can't change, really I can't. There's a block there and in some moments I kind of realise I wouldn't want to be very social. I love that I seek joy in a hot chocolate, a large duvet and a phone call/DVD reading or letter writing. 3. Are you ever judgemental of other mums who are different from you? Answer honestly even if only in your own head. In general I am not someone who severely judges another person. If you know me in person you would know I have a thing for a group of mothers at school. I don't dislike them, in fact I do not know them but they do not let many penetrate their tight knit group, they come across as rude and fairly self indulged. I have made judgments on those mothers and I have no doubt in my mind they have their own towards me and all the other mothers they won't look at let alone speak to. I'm sure they are very nice people, but perhaps I am not one of 'their' people. 4. What would you like to be different about you? I'd like to take things to heart less, it's incredibly frustrating and draining but I don't really know how to not be affected by other people's words. I also worry that I would lose a part of myself and be less caring and understanding. 5. Have you ever being attacked or bullied for being different? How did that affect you? The biggest difference I have and always have had is a physical difference. I've written before about excessive blushing, it's very painful for me and my bullying started at 9 years old. I was made to feel uncomfortable in my first two years at secondary and was bullied again at age 14 which started off a very rebellious phase for me, hiding my anxieties and acting out. I guess I gave myself a false confidence and in a bad way. I didn't use it for my education that's for sure! It has affected me to this day and whilst I have done things I am incredibly proud of there are loads of things I can't do because I'm just too scared. 6. If you had to write an advert for yourself as a limited edition ,what would you say to make people think you were great? Like everyone else I don't feel I can find any words to answer this question! It's much easier to hear great things from your loved ones and friends but to 'big yourself up' feels some what difficult, I wonder why that is? Yesterday I stood waiting at the nursery gate overhearing a mum being told her son had been pinched on his back by another child, that he was okay and both children said sorry to each other over whatever the incident was. "Oh God please don't be A" I thought. Then the nursery teacher smiled at me, called A out and I realised with a huge sigh of relief that it wasn't my son who had hurt a fellow classmate. Then the head of the nursery asked to speak to us..turns out A had been involved in an incident that day, at playtime, with a reception child. He had slapped the child so hard he had left a mark. I was mortified. Gutted. They couldn't tell me exactly what had happened and they said A couldn't tell them. They said a teaching assistant only caught what looked like the older child running past A and then A slapped them. "Perhaps they accidentally knocked him?" They suggested. That's enough with A. When he is so focused on something and someone snatches an item he is playing with, or knocks/hits him even by accident he will take it incredibly personally and will lash out. I was surprised that the teacher I was speaking to was so confused as to why he couldn't tell them what had happened. Why she was confused that A didn't say sorry when prompted, instead repeating everything she was saying, including the apology. He is in speech therapy. He doesn't KNOW HOW TO COMMUNICATE. He will REPEAT EVERYTHING YOU SAY. Today I want to keep him home. I am terrified of bumping into the parent of the child he hit. I am sure he will do it again, and I hate that I know this. He will be known as the nasty boy. The boy who you shouldn't hang around. He is friendly, happy, curious. He just zones out and he still just can't talk to me or anyone else like the rest of his classmates can and it's breaking my heart. Yes I am taking this very hard. I am his Mother and as such it is assumed by other parents who may one day find out that A has hurt their child that I don't care, or that I don't teach him right from wrong. I am a GOOD Mother, I do not hit my children, I do not allow it in my house, I do not show violence or anger towards my Husband or anyone else. But I am lost. I want him to talk. Everyone tells me I will have that one day and wish he'd shut up but I can tell you now, the day he leaves nursery and tells me about his fun like his friends do will be magic. And I will never wish for silence. All I can do now is speak to his teachers, hope, implement some things both here and at nursery, read him books on not hitting. All I'm doing today is feeling scared and crying for myself and my boy for many different reasons. The Lego Movie- Everything Is Awesome! Yep, thanks to suppose.com we have recently been able to watch and review this fantastic movie (and get the very popular theme song firmly rooted in our ears!) Both Midge and Little A were beyond themselves with excitement when they opened the little package containing the DVD yesterday. They both play with Lego, not the small stuff, the bigger Lego for now but I'm pretty sure it won't be long before the little tubs start arriving at my house..possibly for Christmas! The Lego Movie follows the main character Emit, an ordinary builder getting along in Lego City and his job when he is mistaken as 'the special one'. He proceeds to go on a journey with many well known and wonderful Lego characters to travel through different worlds desperately searching for the 'Piece of Resistance' that will help save the world! I shall say no more! I, a notorious film hater, didn't pay much attention until the end of the film when I realised this was no ordinary animated movie and proceeded to re watch it before school this morning with the children..It was Awesome! The children loved it, my husband thought it was great too! For adults and children alike, this is one movie not to miss. We were sent a free copy of The Lego Movie DVD for the purpose of this review. All opinions are my (or my families) own. Yes! 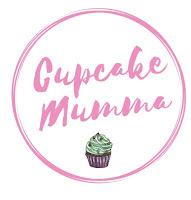 CupcakeMumma is 3 years old! The only thing I've ever stuck to is child rearing (and lets face it, I don't have a huge choice there wink wink) so I am thrilled to still be here 3 years later and enjoying blogging. As a thank you, I've put together a little gift for my faithful readers. Just leave comment on my blog, perhaps tell me what you like, if you'd like to see something in particular on here or your favourite post? 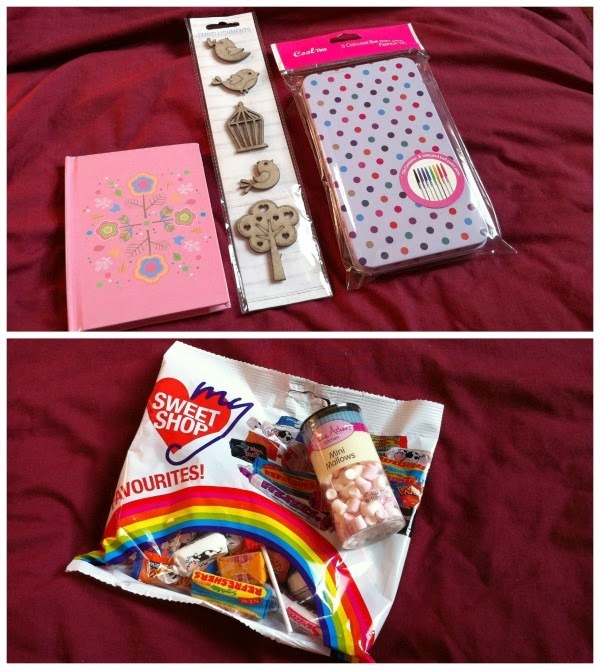 Retro sweets (which have been placed into a more attractive tin), mini marshmallows, mini notebook, woodland embellishments, cherry keyring, pencil case and an iron on clothes transfer. It's not much but it's a thank you. You don't really watch doctor who right now (you should) but let's just say you've managed to hop aboard a cool time travelling box with a handsome man to deliver this letter to your 17 year old self. You're currently pregnant, 1st or 2nd trimester, that wasn't clever but dont worry it'll all be fine. Your daughter won't sleep much so you should cram that in rather than watching trashy tv until late. Make sure you talk more and be honest with those around you. You're going to be exhausted, sore. Start speaking up for yourself. You'll never be one for confrontation or giving your opinion but you do start to say 'no' more often in the future, I'd suggest you go for it now. A room full of people will want to visit you when your baby girl isn't even 24 hours old. Please say no, or make sure someone says no, please!! Save your money. You don't particularly waste it but you do have plenty of moments of spending a bit too much. Trust me you'll need the pennies, there's a few spanners in your future works. You'll get through it but it would be easier without borrowing money. I can't tell you more than that. If I do you won't end up in the lovely place you are now. Things will be tough for a few years but you're not alone. Communicate with your future husband (yes you do get married, and yes it is in 2012 like he always said so stop badgering him and wasting your time, having arguments etc, you are so lucky to have him) Don't do that college course you're thinking about, it'll be seriously bad for you, not doing it doesn't change your future it'll just make your anxiety worse. Don't worry, you'll break your anxiety to a certain degree, I'm still working on the rest, we dogreat things! A few other pointers: Stay in the birthing pool, don't destroy your diaries and notebooks because you will wish you had them still. You love to write, you have loads of pen friends; it's your favourite hobby! So is keeping memories and you'll often wish you had kept more than one silly year 7 Winnie the Pooh calendar dairy! Finally, very soon you'll be totally banished to the free from aisle in the supermarket. Don't carry on eating and making yourself feel like a fat sick thing, I happily condone the spending of some of those saved pennies on chocolates you love, cereals that actually stop tasting like cardboard (you better believe it!) and oh yes, pretty soon you'll be able to get cakes, biggish cakes that you can scoff all to yourself (you do, you're pregnant, no one judges you. Well may be a bit) so I'd suggest a stock up of those. Ps Don't eat quite so much after the babies, don't buy a bed from pound stretcher, don't dither about blogging because it's the making of you in many ways and lastly, don't lose yourself. I'm struggling to find a bit of the old you, the you you're soon to be in a few years. Fun, crafty, really happy. Hold on to that for me. Oh, and don't get a dog, your Dads right.. This post was written in partnership with Legal & General as part of their 'what would you say to your younger self' campaign. Recently I was asked to try out and review a couple of recipes from Ooberkids' Pocket Money Cookery. OoberkidsRepublic is an online community for primary aged children that helps them with homework and gives them educational ideas for activities both on and away from the computer screen! It's definitely a site Midge was interested in and I think we shall consider signing up to look at it more closely. First, we looked through the recipes and loved the names CeCi (the author) had given her creations. All of the recipes in Pocket Money Cookery are from CeCi's childhood and I always think it's lovely to include childhood recipes in cookery books. There's not one or two recipes from her childhood but the whole book is full of them! All of the titles in the book made us wonder what the story was behind them so it's great that we could find this out with CeCi's 'Curiosity Corner,' where she explains either about the name given to her dish or about a part of the recipe itself. Pocket Money Cookery also features Childhood Nutrition Therapist Jessica Scott, who explains after every recipe the benefits of each dish in a child friendly way which I think is great because older children can easily read this simple information and the fun facts about the food they're cooking with and going to eat! All of the recipes in this cookery book are easy to follow with clear, simple, step by step instructions. An older child (definitely 10+) would need very little adult assistance and with children slightly younger who are able to read I think they would still only need a little adult input and perhaps some prep help. Winter Mud Dessert was so straight forward and easy to make. I changed the recipe a little because none of us like ginger and I used tinned fruit instead of fresh (end of the shopping week and tinned is cheaper!) The dessert was delicious, we all enjoyed it. I recently received the actual book for a giveaway on my blog (see below) It was great to look through both the e-book and the actual book. There are 10 recipes all together in the Pocket Money Cookery book and my only criticism (but I have to make it because it's important to me and I can't leave it out) is that there are about 2 or 3 photographs of the finished dishes in the book that have been taken really well. The rest of the images let down fantastic sounding dishes which you know will taste great but are put off cooking because of the photos (Midge definitely was) I would honestly prefer to see these dishes being photographed in a good light to really show how appetizing the dishes are. Having said that, I loved the idea behind the book, I love the recipes and their creative names. I really like how the book encourages hygiene, is super easy to follow and the inclusion of food facts and child friendly nutritional explanation is just brilliant. You can purchase your Pocket Money Cookery book here for £7.00. Ooberkids have generously given me a copy of Pocket Money Cookery to give away right here on the blog! So follow the Rafflecopter instructions carefully and good luck! Join a Halloween Gift Swap! I absolutely adore Halloween it's so very close to Christmas on my love of seasonal celebrations. It's probably my favourite to be honest. The pumpkin carving, the fact it's in autumn, 2 days after my birthday. The spider fairy lights, cotton cobwebs, cute Halloween outfits and little Halloween parties. To share the Halloween spirit I want to host a Halloween gift swap! I've already posted on Instagram so give me a follow and sign up there or leave me a comment below. I'd love people to sign up and will post updates on Instagram and twitter, share your swaps and i'd love for you to blog them too! This swap doesn't have to include anything hand made but if you'd like to make something spooky to go with your Halloween gifts that's absolutely fine! This swap will be a direct swap, so you'll know your partner and be able to keep in touch. This swap is uk only and items should be swapped before 31st October. I'll leave sign ups open until 20th September. Get excited for Halloween and join in! It's been a while since I actually sat down and thought about what I was going to write on Cupcake Mumma. Last week I had a bit of a moan but we were all ready for the school routine to start again and so far I've been proven right. I've not been around much here. I've been adding to my stationery collection, catching up with my best friend, writing letters and taking part in swaps. A lot of this I do want to blog about too and I will do..I see no rush. So, the summer holidays have been a huge blogging mojo killer. I'm still not really there, I need a laptop that's what I need. My current system for sending and editing photos is long and irritating. Not a good mix for blogging! I'm hoping something will turn up soon *looks at parents with puppy dog eyes long before birthday* surly 25 is a milestone no!? So that's a little bit of absence explained. What's been happening with The Cupcakes? Like most of the country we are now back at school. Midge has settled in wonderfully and loves year 2. Her teachers seem friendly and easy to talk to which is important at all times but even more for me as Midge can be a bit shy and I worry about her. Her class have been to the woods and Rainbows had started again! To celebrate 100 years of Brownies, she's off for a day of activities with Rainbows, Brownies and some Girl Guides on today! How fun! We're all going along as usual here and getting back into the swing of things. Blog wise, I've put together a few bits to giveaway as it is my blogs 3rd birthday on September 19th! I want to blog about my brand new subscription box, my latest craft swaps, share some paper love, show off our vegetable growing efforts and there's a recipe or two to treat you with too! 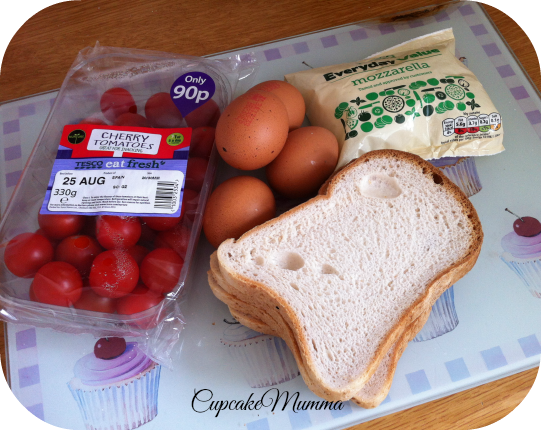 Plus a pocket money cooking book review and more! I look forward to writing properly again, thanks for not abandoning me ! Crafty Creatives Brings you: #Paperhaul! I'm so excited to be writing about this brand new monthly subscription box from the lovely people at Crafty Creatives. Crafty Creatives are now branching out to possibly my favourite thing of all time (after cake I should add) yep: stationery! #Paperhaul is going to be a monthly subscription box packed up beautifully with all your stationery wants. Think cards, washi tape, stickers, postcards and even more. I'm going to be signing up to receive the boxes, which are at a limited number, as soon as I can. Each month you'll pay just £10 plus P&P for your box which is going to be a great deal knowing what I do about the company and how they source truly great items for their customers. I feel very lucky to be a part of their blogging network and will be receiving my box at a discounted price. So, Keep your eyes peeled right here for updates on #Paperhaul and follow them on twitter @paperhaul so you don't miss out. If you're anything like me you'll probably weep if you don't get your hands on a box of Stationery goodness! I look forward to seeing lots of posts, pictures and tweets from fellow letter writing lovers in the very near future.